Cooking can be stress buster for bachelors. More so if you don’t cook so well but can lay your hands on a book with an easy but mouthwatering recipe. Well, I had Satarupa Banerjee’s The Book of Indian Sweets (affiliate link) for help. Missed my swimming lesson yesterday and so was desperate to put the evening to good use. 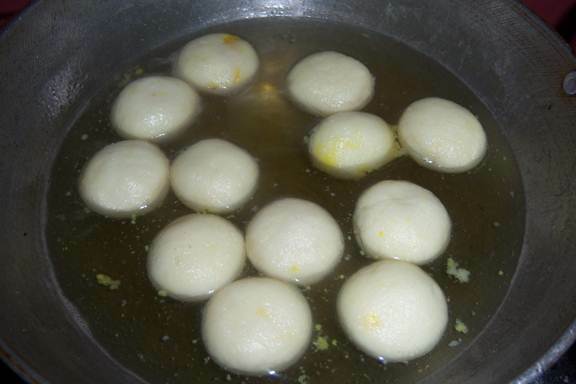 I received the book yesterday from Kwench, and not having cooked for a while I decided to start with what a Bong outside Bengal craves for – The Oh-so-Awesome Rosogolla. You can search the internet for several videos, recipes and prep styles for Rajbhog so would include just the basic style (without the jazz). Note: I prepared 12 giant balls (no pun intended :P) with these. So, if you want more/less, extrapolate the figures accordingly. 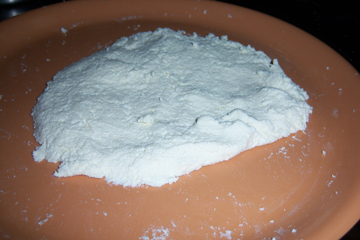 Ensure that the Paneer doesn’t have too much water (yeah I know that sounds a little moronic), and knead the Paneer with your palm well until it becomes smooth. Tip 1 (For Beginners): at the start you may not know the optimum size of each ball, so don’t worry. Once you start making a few Golas, you would get a hang of how much Paneer to put in each Gola. 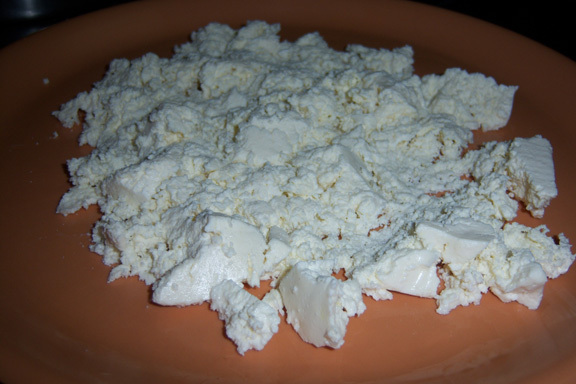 Now, that we have Paneer Golas, we need to make some Khowa/Cardamom balls and put it inside the Paneer Golas. Lets get started. Mix Khowa and Cardamom (Elaichi) seeds and divide into 12 portions (I made 12 balls). 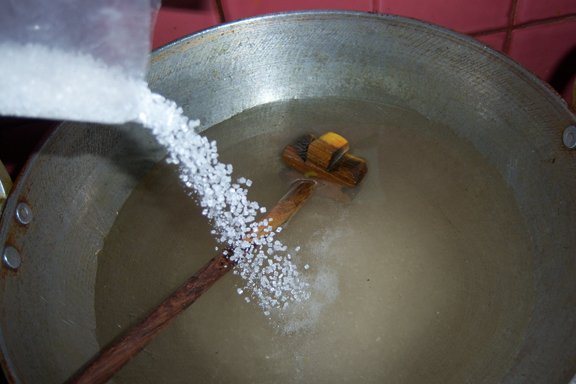 Tip 3 (For Beginners): if you don’t, while boiling the Golas in sugar syrup, the Khowa would drain out. It happened to 2 of my Golas. Okay, now we need to prepare sugar syrup and then boil the Golas in it. Lets do it. In 750 ml water, put ½ kg sugar and boil it. When the sugar seems dissolved, pour another ½ kg sugar and continue with the heat. A while later (say 5-7 minutes), you have Sugar syrup with you. Put your Golas one by one into the heated sugar syrup and continue with the boil. You’ll see that the Golas increase in size (I mean they will get puffed). Continue for another 7-8 minutes and you might see some crack appearing on the Rajbhog’s surface. Remove them from fire. You’ll have let the Golas soak in sugar syrup for a few hours (say 3-4 hours) before you can have them. Tada, your Rajbhog is ready. 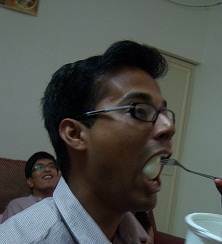 Try having one Rajbhog in one mouthful J. If you can, send us a photo, we’ll publish it here. Hummm..birds of the same feather bla bla …….engineers jindabad…from kitchen to workplace.. everywhere we will use engineering. I have slight advantage over other birds of same feather, i.e I am a chemical engineer and have been cooking chemicals , oil and gas for 4 decades along with ( but separately from chemicals) food. 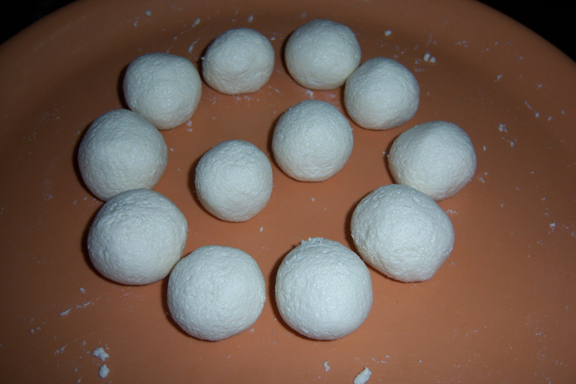 Bong Rasogollas ( with its origin in Orissa) are essentially made in thin syrup. I am sure Sudeshna has the recipe in her blog. I have too. Yes you are very right …cooking is the only hobby which will burst stress any time, even if momentarily ..thats how I took many Koreans to cooking. 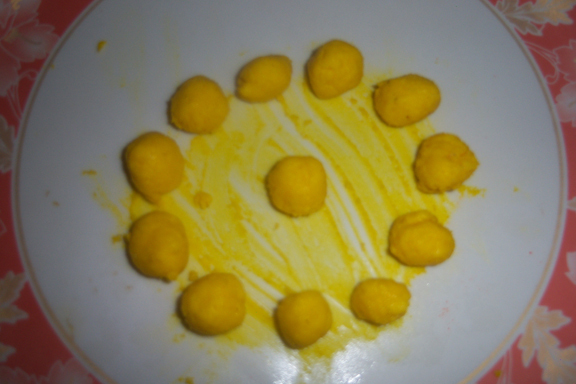 Cooking is one hobby which needs 100% of your attention every moment, so that one doesn’t think about Boss and the lady of the house ..
Let me see all your postings…and in the evening let me see if I can get some Khoya devoid of maida, corn flour . I am a great follower and appreciator of Sudeshna ( dont tell her).